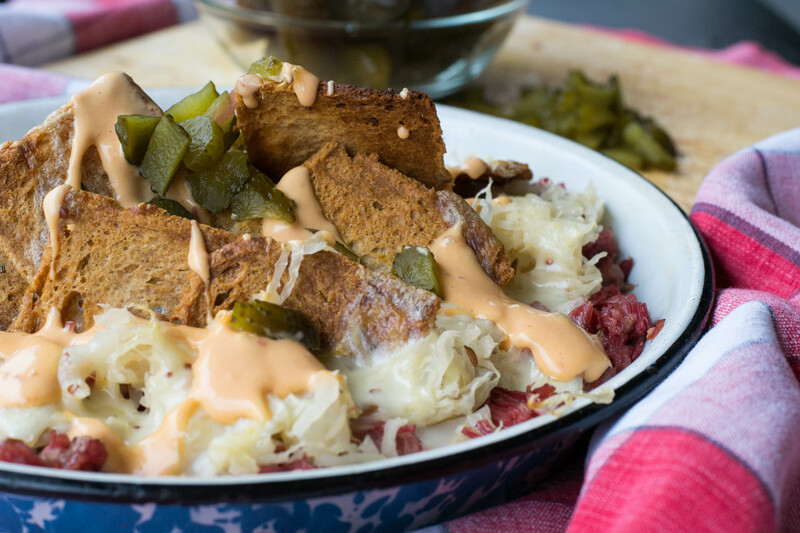 corned beef Archives - What the Forks for Dinner? 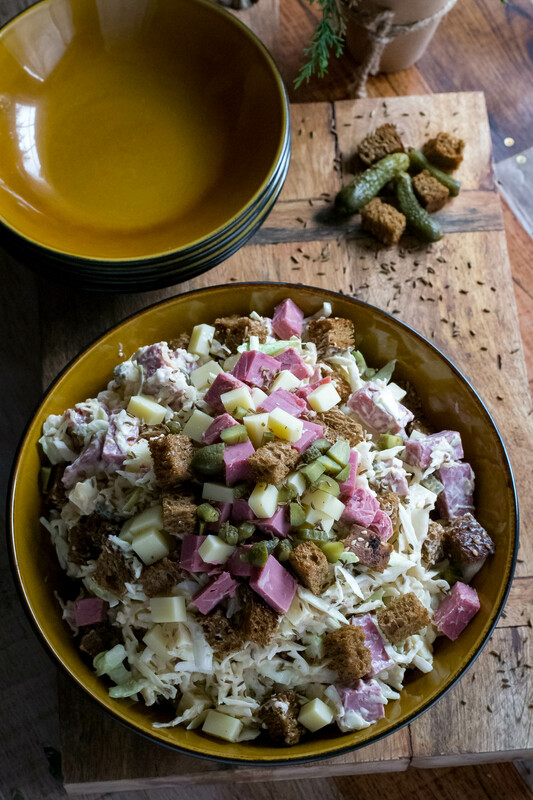 Not your usual St Patty’s Day fare, Rustic Rueben Slaw is a new twist on a Rueben Sandwich. Using a prepackaged cabbage mix, cubed corned beef, cubed swiss cheese, and a tangy 1,000 Island dressing. 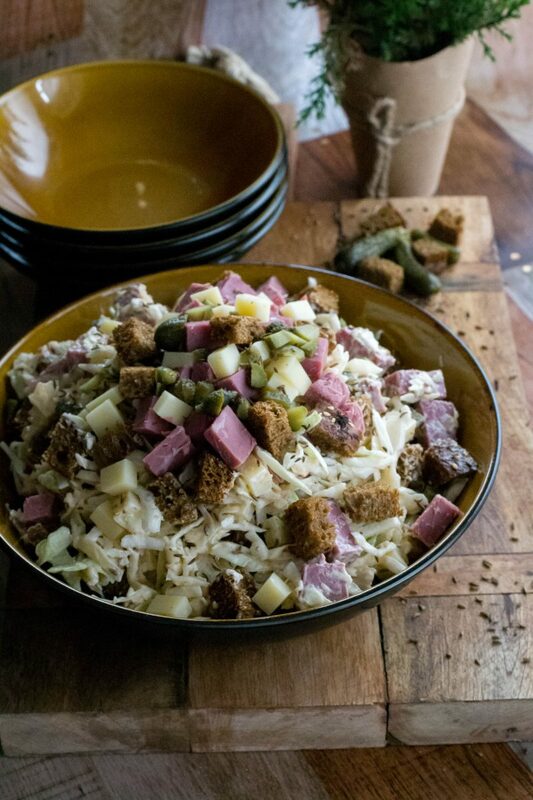 Rustic Rueben Slaw is all you love about a Rueben in a salad form. 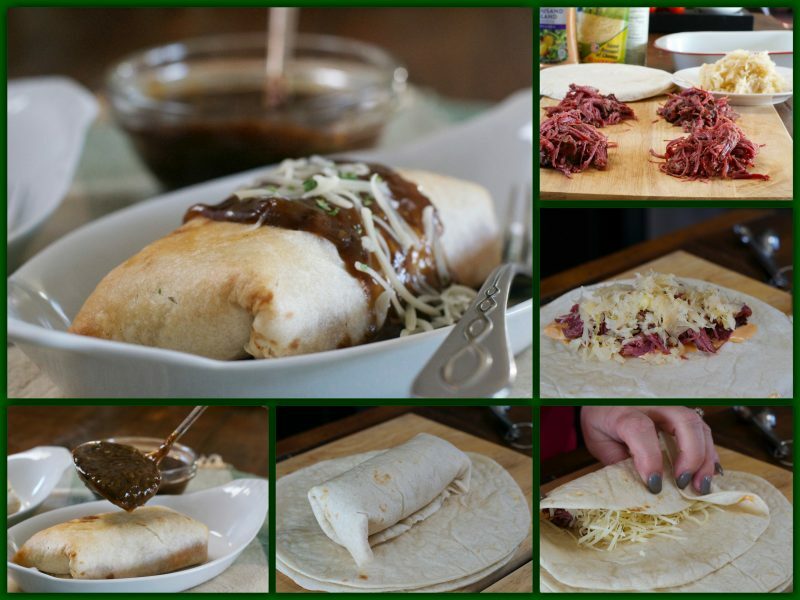 What are you going to do with all that left over corned beef?……. 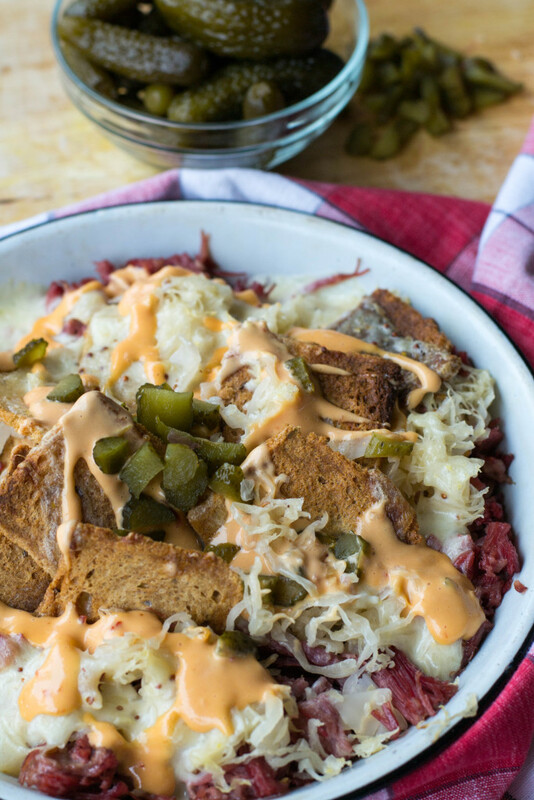 Rueben Nachos thats what! So after St Patty’s Day you have some left over corned beef. Not really enough to have for a meal but you don’t want to throw it out. 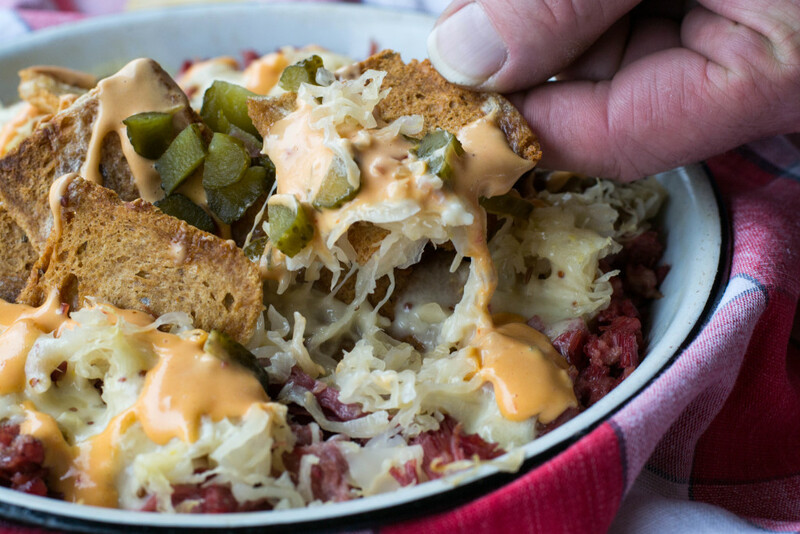 Rueben Nachos are just the ticket. And since St Patty’s Day is on Thursday this year, you can have Nachos on Friday or Saturday night. I have never seen rye chips so, I made my own. 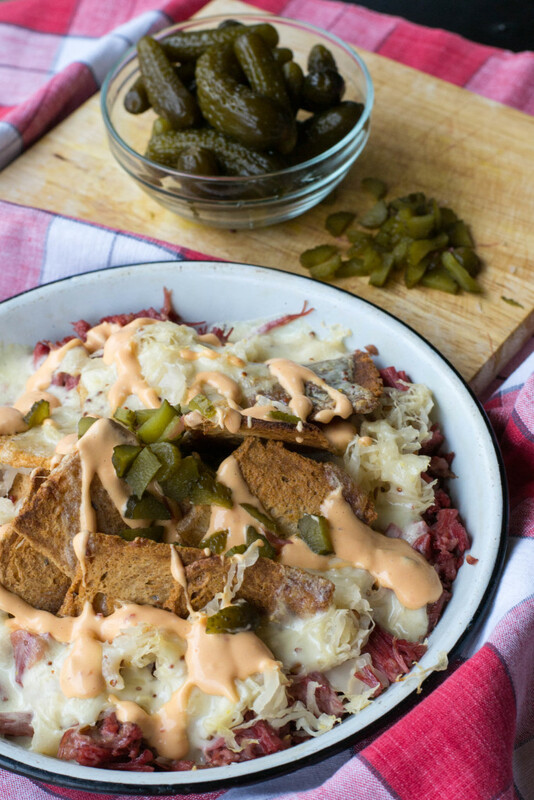 You know those little cocktail party bread loaves you get for the cucumber sandwiches……..well I thought they would make the perfect base for nachos. Pepperidge Farm has a light Jewish Rye Party Bread…..perfection. Roll them thin and bake them they are as close to a rye chips as you can get, and rueben need mohave rye bread. A little spray of non stick cooking spray, into the oven, and you have rye chips! Cool huh? Now of course you need that left over corned beef.I actually cooked a small on in …….wait for it……my pressure cooker! It took 90 minutes, but it came out perfect. I shredded and chopped it. Heap the rye chips on a cookie sheet or in a baking dish if you want to be fancy. Place the corned beef around the edge, at least that is what is did if you want to layer it on top of the chips feel free. Next sauerkraut. For my money Frank’s Sweet Bavarian Kraut is the best. Be sure to drain to and squeeze it dry in some paper towels. The last thing you want is soggy chips. I just kind tossed it on top of the chips, but if layering is your thing, place it on top of the corned beef. I decided that beer cheese sauce was what should go on top. I have always had beer cheese made with cheddar……..swiss is the bomb! A couple of tips…….be sure to not boil the beer, heat it just until its hot. Coating the cheese in corn starch helps to thicken the sauce and kinda, keeps the sauce from clumping too bad. It will clump so be prepared. Try to add the cheese slowly and keep stirring. At first you will think what have I gotten myself into and why isn’t this working……keep stirring. It will like magic melt and be beautiful. Just before you pour it over the nachos, stir in some grainy mustard. This beer cheese is too good for words. I put mine under the broiler for just a few minute to kind warm the corned beef and let the cheese melt down into the chips all the while keeping the chips as crispy as possible. Once out of the broiler, drizzle with 1000 Island Dressing and chopped pickles. I am not a huge fan of sweet pickle but they added that little something extra. Trim the crust from the rye bread and using a rolling pin, roll each slice as thin as possible. Place rolled bread on a cookie sheet and spray with non stick spray. Bake in preheated oven for 7-10 minutes or until browned and crispy. Remove from oven and set aside to cool. Meanwhile place shredded swiss cheese in a plastic baggie and add cornstarch, shake to coat cheese. Pour beer into a small saucepan, warm the beer but do not bring to a boil. Add cheese/cornstarch mixture in small batches, continually stirring. It will be a big glob of cheese, but keep stirring, it will melt. If sauce is too thick add beer until desired consistency. Stir in mustard, keep warm. 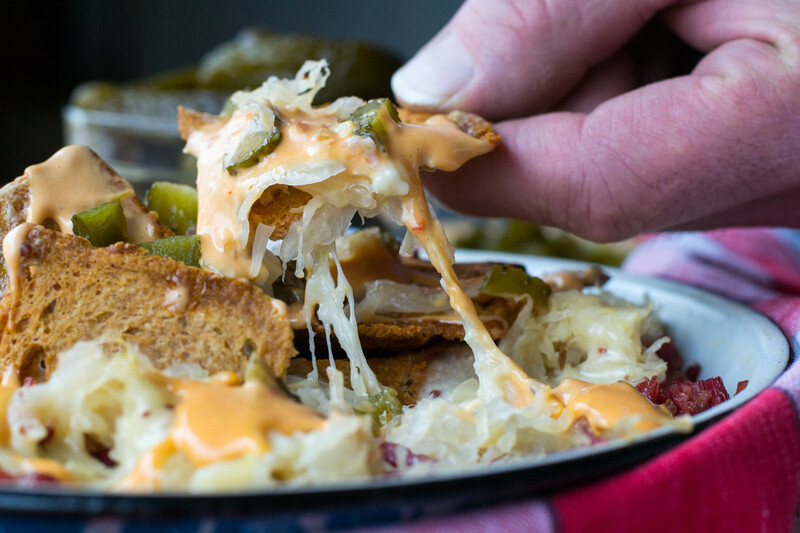 To assemble nachos heap toasted bread onto a cookie sheet or baking dish. Place corned beef around the outer edge of the bread. Top bread with sauerkraut, and pour cheese sauce over top. 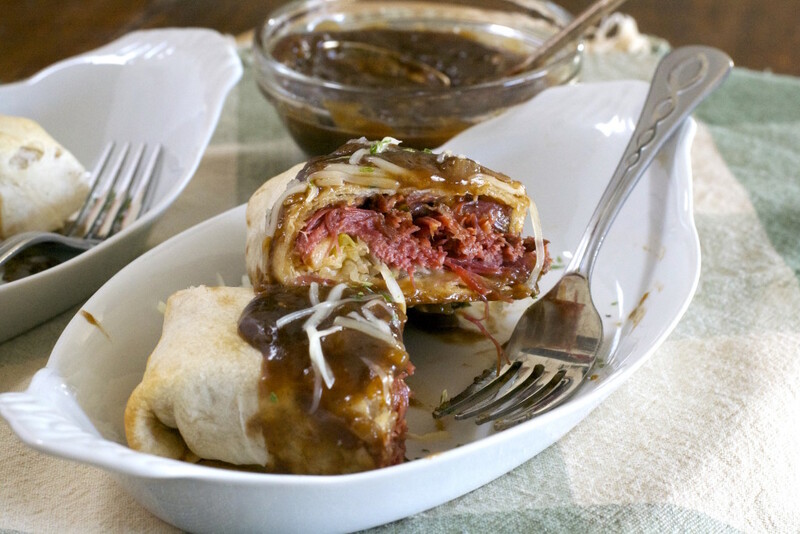 Place under broiler for a few minutes to warm the corned beef and melt the cheese into the dish. Remove from broiler and garnish with 1000 Island dressing and pickles. St Patrick’s Day is traditionally a corned beef and beer day! I must turn to the unconventional……..kinda. The Kelly family has owned it as long as I can remember. The untraditional part…….they serve Mexican food…awesome Mexican food!